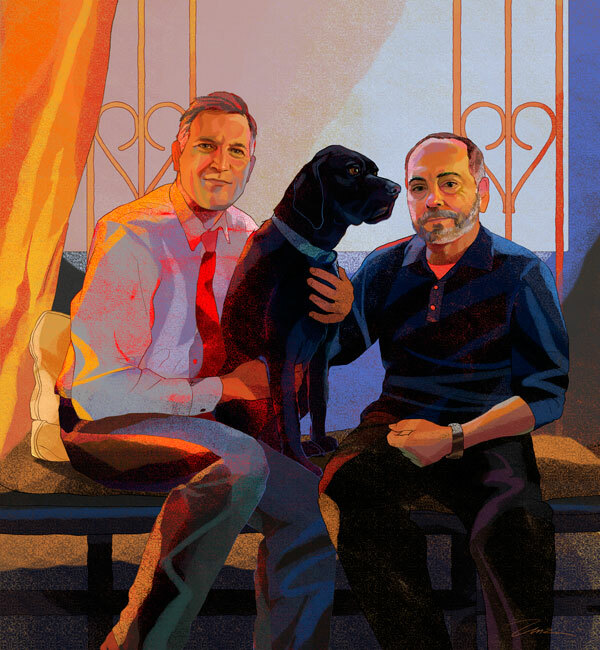 Bruce (left) and Alfonso have been a couple for nearly 25 years and have watched the shape of their private world shift along with the larger world around them. Bruce: I went to college in the ‘70s and in some ways we were more free then: Jimmy Carter came out against Anita Bryant banning gays when he was president of the United States. He was very outspoken about that. There were people in college who were out at that time, and when I moved to New York, it was a very comfortable place to be gay. There were issues about in the workplace – whether you would reveal it or not – but in some weird ways, it seemed like society has moved in a wrong direction with the “Don’t ask, don’t tell” stuff, and not legalizing marriage for gays. Alfonso: I have a feeling that Karl Rove saw that Republicans were apathetic in 2004, and they weren’t going to get out to vote in the presidential election, so he worked to put all of these anti-gay marriage bills in local elections; they politicized and demonized us so people would get out and vote against gay marriage. I think I’m more out now than I was when I was in junior high school or high school, but I don’t know, how do you define out? To what degree is “out” really “out”? Sometimes I teach playwriting in the schools, and I hear these kids making homophobic comments, and I say, “Tell me what that means,” and I challenge them and then I weigh the consequences and I might decide to say, “You should know I’m gay.” A lot of them go, “You can’t be!” They think I’m just playing devil’s advocate. I think they kind of admire me and feel like that’s something they might not have the courage to do. I’ve met gay kids that I know are gay, but I don’t say anything. They’re struggling, and I feel bad for them because I know what that’s like, to try to hide in your own skin, but you can’t because the boa and the tiara give it away. Alfonso: We’re a legitimate couple, but we’re not recognized as that. As soon as we moved in together, seven years ago, we went down to City Hall and we became domestic partners to protect me in case something happened to Bruce and they would want to kick me out of this apartment. We’ve only lived together seven years because before 9/11 we each had our own affordable apartments. After 9/11, things changed: I lost my job which was located within the World Trade Center, and also lost my apartment, which was an illegal sublet and the management company started cracking down with new security measures, so we moved in together. I think moving in together was the biggest challenge in our relationship in a lot of ways. I had a lovely one-bedroom in Tribeca with a great view and he had this place for himself, and I had to leave my space, so it was a bigger adjustment for me. I didn’t feel like I owned this apartment; in a way I felt like I didn’t belong here. And then I kind of ripped out the kitchen and redid stuff and we just made it our home together. So that took a little while, and it was really difficult for me, at first. Bruce: And we are very much of the opposites-attract kind of relationship, we are very different people: I’m introverted, he’s extroverted. Alfonso: I’m a risk taker, and he’s not at all. Bruce: You would have thought, because I’m more withheld, that it would be harder for me to get used to living with someone and it would be easier for him, but it really was the opposite: it was much easier for me to get used to having him around all the time than for him. Alfonso: There used to be a time when we said we would never get married, that we would never choose to mimic a heterosexual institution. And now we want to be just like heterosexuals and we want to do everything they do. Only we’re not allowed to. So we’re damned if we do and damned if we don’t. But I think we’ve changed our minds. Have we changed our minds about getting married? Bruce: I didn’t feel that way: I didn’t want to get married yet, but that was more personal than political. When I see young women whose biggest dream is to get married in a white dress, I can’t imagine having all that attention on me; I would hate it. Especially in terms of expressing love and intimacy... that all feels very private to me. My personal belief is that everyone should have the right to either do what everyone else does or do something completely different. Alfonso: We have a house upstate where it’s rural and really Republican. We’ve never forced ourselves down these people’s throats – they get to know us and they like us and they kind of accept us: “Okay, now we know a gay couple and they really don’t eat first-born children and they don’t spout fire.” So I think that it’s more like infiltrating by example, by showing who you are and what you are; you’re just another person that struggles and has a life. Bruce: For me, I think the biggest thing is that as a gay couple, what’s important to us are pretty much the same things that are important to a lot of people. Like I was diagnosed a year and a half ago with lymphoma, and we’re struggling with health insurance and not having a pre-existing condition and all these crazy things, but they're the same things that anybody has to deal with. Alfonso: But that’s changed because straight men have changed, too. My Gay-dar isn’t what it used to be: I can think someone is gay because they talk softly and they bare their soul, but they’re straight men. You see straight men who are very fashionable, they wear dandy kind of clothes and they feel comfortable; there is really a range of they way they can look now. I don’t think we necessarily feel like we need to give signals anymore. In the ‘70s, people were wearing kerchiefs in their pants pockets – the blue in their left meant one thing, blue in their right meant another, robins egg blue meant something different from the navy blue – they were signals, they were our little badges. Now we’re hiding less, so we don’t have to wear badges to send out the message. Bruce: In the early ‘80s when I was first in New York, I was really shy and I didn’t feel like I was a part of the gay community. AIDS opened up a door to me, where I could do volunteer work and meet a lot of people and make connections and then begin to feel like I was a part of something that I didn’t feel like I belonged to before. It was a huge political movement, and [gay rights activist] Larry Kramer was very big about it not being okay to be in the closet anymore: everybody has to make themselves known or the government isn’t going to take any action against AIDS. I feel like he’s my best friend. We spend a lot of time together, but the thing about us, we both have separate lives. I mean, we both do a lot of stuff which has to do with theater, but we do different activities apart from each other and have separate friends; though less and less the older we get, because people fall by the wayside, or they die, or you just can’t stand them anymore.